—and these next few months in this, our second year of marriage. tangled flesh on a bony bed, corporal fight over real estate. Kids, cats, pigs, wander in, dogs chase across our shared pillow. with fleabite blood, our eyes vigilant watching doorless doorways. at least a curtain, it must be in the dictionary. Sleep’s private kingdom! a bed that fits us. Sick of mañana, I turn on you, oh husband, you foreign sore. turned spider—menacing, strange—legs so fragile, frantic with webs. SOURCE: “Foreign” first appeared in Homesickness and Exile Anthology (Eds. R. Piercey and E. Wright). NOTE FROM THE AUTHOR: This poem, “Foreign,” published in Homesickness and Exile Anthology, (Eds. R. Piercey and E. Wright), is about my time as a Peace Corps volunteer and moving into the home of a family in Ecuador for three months during our training. My husband and I didn’t speak any Spanish yet, and for our first week a small bed was set up for us in the dining room that doubled as a saloon. Anyone or anything — kids, pigs, goats, dogs, etc., entering the house had to go through our room, which had no door inside and no curtains; my husband and I were in our second year of marriage. ABOUT THE AUTHOR: Mary Buchinger is the author of two books of poetry, Aerialist (Gold Wake, 2015) and Roomful of Sparrows (Finishing Line, 2008). Her work has appeared in AGNI, Cortland Review, DIAGRAM, Gargoyle, Nimrod International, PANK, Salamander, Slice Magazine, Massachusetts Review and elsewhere. Visit her at MaryBuchinger.com. We extend our gratitude to the 80 writers who participated in our MY MANE MEMORIES Poetry & Prose Series, which ran from Feb. 14-March 24, 2016. Many thanks to the following authors for an amazing series! Gerald Locklin, author of the Silver Birch Press release Gerald Locklin: New and Selected Poems (1967-2007), is featured in Ekphrastia Gone Wild: Poems Inspired by Art a new collection from Ain’t Got No Press edited by Rick Lupert. Ekphrastia Gone Wild, an anthology of ekphrastic poetry — poetry inspired by other works of art (painting, film, literature, photography, and more) — includes work by Nobel Prize winning poet Wislawa Szymborska along with 87 poets from around the world. Ekphrastia Gone Wild contributors include: A.J. Huffman, Ackroyd Jackson, Adam Kress, Alan Britt, Alan Price, Alan Wickes, Ann Drysdale, April Salzano, Benjamin Taylor Lally, Brendan Constantine, Brooke Dorn, Bruce Taylor, Carolyn A. Martin, Catherine Graham, Consuelo Marshall, Cynthia Gallaher, Dan Fitzgerald, Daniel Y. Harris, David Chorlton, Deborah P. Kolodji, Desmond Kon, Donald Mulcahy, Doris Lueth Stengel, Douglas Richardson, Dusan Colovic, Elizabeth Iannaci, Ellaraine Lockie, Eric Evans, Eric Lawson, Eric Tuazon, F.J. Bergmann, Farida Samerkhanova, Fern G. Z. Carr, Fiona Curran, Florence Weinberger, Gabrielle Mittelbach, Gene Grabiner, Gerald Locklin, Graham Fulton, Helen Bar-Lev, Iris Dan, James Bell, Jan Chronister, Jerry Quickley, Jim Bennett, John Stewart Huffstot, Johnmichael Simon, Kath Abela Wilson, Kathleen M. Krueger, Kenneth Pobo, Kevin Cornwall, Laurel Ann Bogen, Leland James, Letitia Minnick, M.A. Griffiths, M.J. Iuppa, Maggie Westland, Mantz Yorke, Marie Lecrivain, Martin W. Bennett, Mary Buchinger, Mary Harwell Sayler, Maryann Corbett, Michael Virga, Mick Moss, Mira Martin-Parker, Neal Whitman, Noel Sloboda, Paula McKay, Peggy Dobreer, Peggy Trojan, Perie Longo, Peter Branson, Phil Howard, Robert Wynne, Ron. Lavalette, Rosalee Thompson, Salvatore Difalco, Simon Jackson, Simon Peter Eggertsen, Sonja Smolec, Stanley H. Barkan, Steve Ely, Suzanne Lummis, Timothy Charles Anderson, Tracy Davidson and Wislawa Szymborska. ABOUT THE EDITOR: Rick Lupert is the author of numerous collections of poetry and founder of Ain’t Got No Press. He also edited the Ain’t Got No Press titles A Poet’s Haggadah: Passover Through the Eyes of Poets and The Night Goes on All Night: Noir Inspired Poetry. He created and maintains The Poetry Super Highway, an online publication and resource for poets and writers, and since 1994 has hosted the weekly Cobalt Cafe reading series in Southern California. He lives in Los Angeles with his wife, son, three cats, and a frog and works as a Jewish Music teacher for local synagogues and as a freelance graphic designer for print and web for anyone who would like to help pay his mortgage. Contact him at rick@poetrysuperhighway.com. 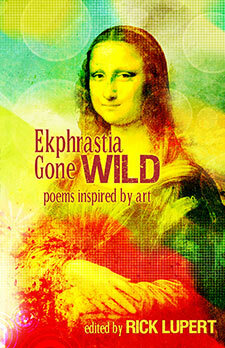 Ekphrastia Gone Wild: Poems Inspired by Art is available at Amazon.com. Tune in to the Ekphrastia Gone Wild Virtual Publication Party, Sunday, September 15th at 2:00 p.m. (PDT) to hear poets featured in the book read their work on a special Poetry Super Highway Live broadcast right here.